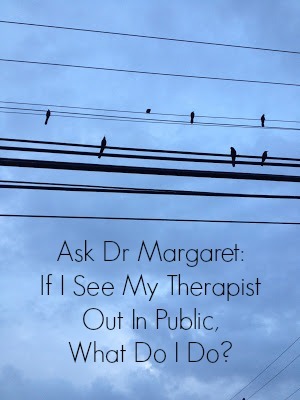 Ask Dr Margaret: If I See My Therapist Out In Public, What Do I Do? What keeps a lot of people out of therapy? Patients frequently share very intimate, often painful information about their lives. From both their past and present. There must be absolute trust that that information, and the relationship, remain private. So when you are in a smallish town, how is that handled? QUESTION: Dr. Margaret, I have thought about going into therapy but don’t understand what happens if I see my therapist out in the community. There are a only a few here. I have met one that I like, but I see her a fair amount. It just seems uncomfortable that she would know things about me and be at the grocery story with me, or my son’s soccer game. Can you help me with this? 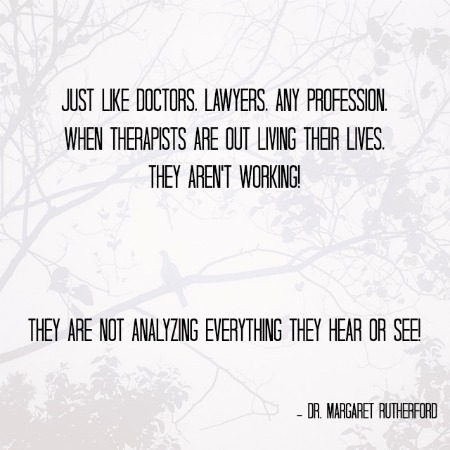 DR. MARGARET: I learned in graduate school that the therapist’s life should not be known to the patient, except in cases where one might choose to reveal something because it would be imminently helpful to the patient. However, in reality – in a less populated setting, that just doesn’t work all the time. Sometimes, the folks that meet you – just think you might be easy to talk to – want to become your patient. That likely means they know something about you as well! A great example of this was when my parents died, one week apart in 2007. It was in the paper. It wasn’t something I was going to talk about necessarily, but I couldn’t hide it. If I know a patient prior to them coming into therapy, or we are likely to meet out in the community, we talk about it. The most pure “ethics” in our profession might be for me to curtail all activity that had to do with the patient until their treatment was over. However, that’s not practical sometimes, if it involves your children or a significant role in the community. The therapist can and should offer to do as much as pragmatically possible to make the patient feel comfortable. As far as more random sightings, I just don’t approach the patient. If they want to approach me, fine. I have been practicing here for over 20 years. I would be a recluse if I stayed completely clear from patients or former patients! I remember walking into a party years ago. A patient was there who I knew was having an affair. He was shocked to see me. I had no idea he would be attending the party, or we would have discussed it. Sadly, he walked out. That’s the kind of situation you want to avoid. I frequently see patients or former patients who say nothing. They might nod or something, if they even recognize me outside of the office setting. Then there are those who kinda grin. “Hi! You really come out of that room? ?” Might even tell whoever is with me that I am or were treating them. These are the folks who are comfortable with the relationship being open. The information remains confidential. Always. What is unethical is any kind of significant relationship outside of the therapeutic one. Because as soon as the therapist has that intimate information, there is a power difference. That can be unhealthy at best, unsafe at worst for the patient. And remember, just like doctors, lawyers, any profession, when therapists are out living their lives, they aren’t working! They are not analyzing everything they hear or see! Maybe noticing from time to time. But not mulling it over. They live their lives. You live yours. Hope that helps! And thanks for the question! If yo have further questions or comments, I would welcome them at askdrmargaret@146.66.99.73. As always, thank you for your interest and reading! Please subscribe today!